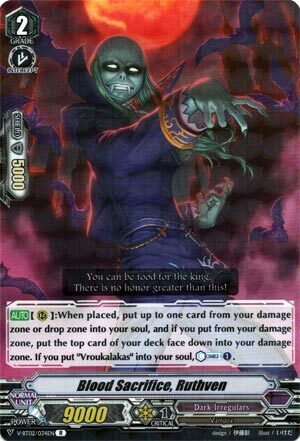 [AUTO](RC):When placed, put up to one card from your damage zone or drop zone into your soul, and if you put from your damage zone, put the top card of your deck face down into your damage zone. If you put “Vroukalakas” into your soul, Counter Charge (1). Probably the surest way to countercharge in the deck, as long as you’re set up correctly. Otherwise it’s one free card from your drop zone to the soul, which you can then recycle with Ghoulish Despoiler (if you’re into that sort of thing). You’re basically never going to fetch from the damage zone unless you’re truly desperate, as by the time you can play this, you could totally just guard once and load the drop zone with like ONE card for this to target, because hells no are you just going to let yourself be a Counterblast down.